LOS ANGELES (October 8, 2012) – Marvel Entertainment and Sony Pictures Entertainment Japan (SPEJ) announced today the return of iconic Super Hero, Iron Man, to the beloved world of anime in an all-new feature-length film, IRON MAN: RISE OF TECHNOVORE. Produced by Madhouse and currently in production in Japan, the film is slated for release on DVD in the spring of 2013. 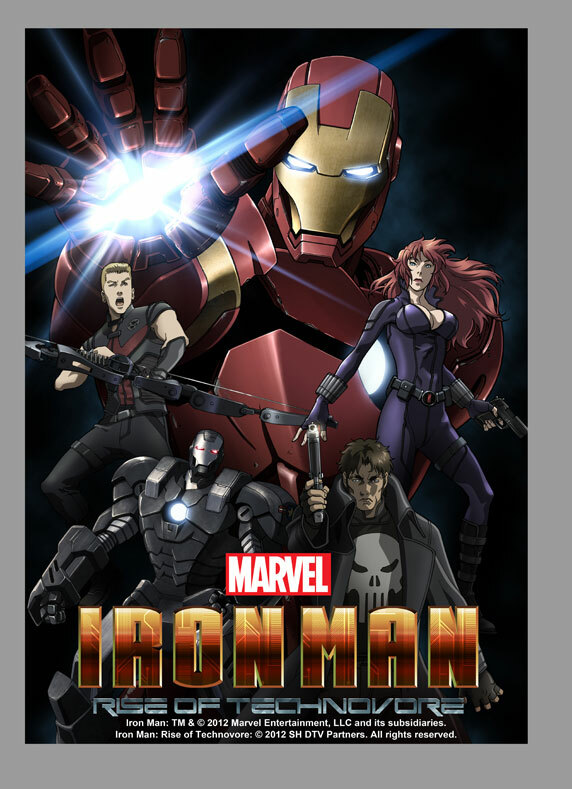 For more information, visit: https://www.facebook.com/marvelanimatedseries and www.marvel.com. Posted by hatlentore in 2000 - present, Comics/Graphics Novels, TV Shows. Los Angeles, CA—October 5, 2012—The biggest pop culture event of the fall is almost here, and Marvel Television will be at New York Comic Con with never-before-seen footage and exclusive announcements! On Saturday, October 13th at 4:15pm in Room 1E13, join Marvel’s Head of Television, Jeph Loeb, as he offers an inside look at the eagerly anticipated new animated series, Marvel’s Avengers Assemble and Hulk and the Agents of S.M.A.S.H., along with an Ultimate Spider-Man season 2 update. But that’s not all…catch a sneak peek at what’s new in Marvel anime, the next Marvel Knights Animation releases, and more NYCC exclusives! This is the panel everyone will be buzzing about – don’t miss it! And to tease what’s in store… check out this image from the one-hour special Ultimate Spider-Man event, coming up on Sunday, October 28th at 11am/10c on Disney XD. Comics publisher Ape Entertainment and digital comics innovator iVerse Media jointly announced today that content produced and marketed under the Ape Entertainment and KiZoic imprints will now be available digitally on the Comics Plus platform as part of an exclusive partnership. Though iVerse and Ape Entertainment have collaborated for years, this marks the first time that Ape has entered into an exclusive arrangement for digital distribution. Current plans call for Temple Run to make its Comic Plus debut first, followed by Squids and then Fruit Ninja. Future titles and release plans will be announced soon. An Ape Entertainment/iVerse collaboration that’s already borne fruit is the Dreamworks Comics app, currently available from the App Store. It features all of the Ape Dreamworks comics, including Shrek, The Penguins of Madagascar, Madagascar 3, Kung Fu Panda and Puss in Boots. Future plans call for a comic prequel to “Rise of the Guardians”, scheduled for release on October 17, 2012.
iVerse Media (http://www.iversemedia.com) is a leading digital content distributor focused on the world of comics and popular culture. Founded in 2008, the company was one of the first to launch digital comics on mobile devices. With millions of iVerse powered products having been downloaded, the “iVerse Engine” continues to be one of the most popular and widely used platforms for reading digital comics in the world. In 2012, iVerse expanded its digital presence by launching ComicsPlus for iOS, Android, and the web. The company is principally located in Waco, TX. For more information, visit www.comicsplusapp.com. Tags: adventure time, animated, Boom Studios, bravest warrior, cartoon hangover, kaboom! October 8th, 2012- Los Angeles, CA- BOOM! Studios is proud to announce that BRAVEST WARRIORS #1 will debut with a New York Comic Con exclusive cover at the BRAVEST WARRIORS Launch Party on Friday October 12th, at Jim Hanley’s Universe. Created by ADVENTURE TIME creator, Pendleton Ward, BRAVEST WARRIORS is the first animated series debuting on Cartoon Hangover on YouTube in October and follows the adventures of four 16-year-old heroes-for-hire in space! Featuring exclusive cover art by animator Bob Flynn, this limited edition issue #1 will be available two weeks prior to BRAVEST WARRIORS #1 arriving in stores on October 24, 2012. Fans attending the BRAVEST WARRIORS Launch Party will have an opportunity to get the first issue signed by cover artist Flynn and BRAVEST WARRIORS writer/producer and Executive Producer, Breehn Burns (DR. TRAN, GLOOM COOKIE) on Friday night. The party, being put on by BOOM! Studios, Channel Frederator and Jim Hanley’s Universe will take place from 6pm – 9pm. In addition to the opportunity to get BRAVEST WARRIORS #1 before anyone else, fans will have the chance to enjoy a screening of the first episode of BRAVEST WARRIORS, enter a costume contest for fabulous prizes, and enjoy food and drink while mingling with staff from BOOM! and Frederator. Jim Hanley’s Universe is located conveniently just 1.2 miles from Jacob Javits Center at 4 West 33rd Street Manhattan, NY 10001. They can be reached at (212) 268-7088 or www.jhuniverse.com on the web. Fans of ADVENTURE TIME and BRAVEST WARRIORS will also not want to miss a chance to check out the Chevy Sonic wrapped in amazing art from both series. The car will be displayed in the lobby of Jacob Javits Center during New York Comic Con and provides a unique photo op! 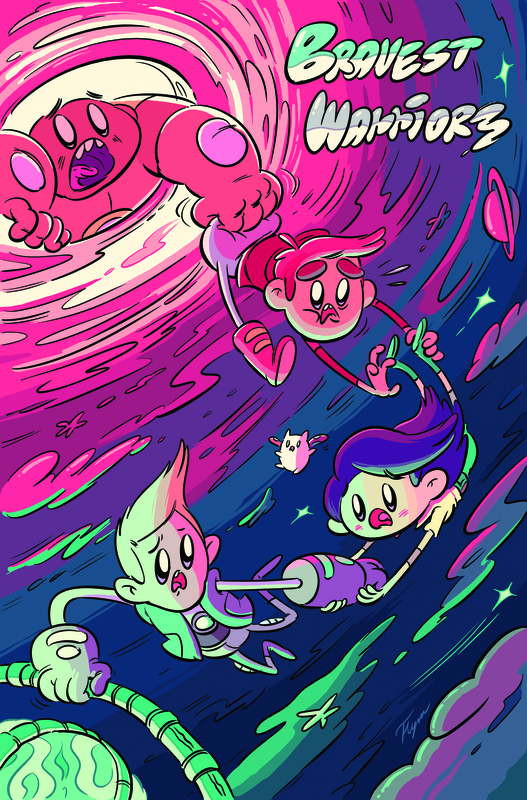 Inspired by the whimsical spirit of adventure in both of creator Pendleton Ward’s cartoon series’, ADVENTURE TIME and BRAVEST WARRIORS, the talented cartoonists’ working kaBOOM! Studios have created unique interpretations of the characters and worlds of both series. The wrapped Chevy Sonic will feature art by Chris Houghton, Kassandra Heller, Tyson Hesse, Nick Edwards, Shelli Paroline, Braden Lamb and Zack Sterling and is sponsored by BOOM! Studios, Cartoon Network, and Channel Frederator. Lastly, the BOOM! team is thrilled to invite their fans to join them at the BOOM! Studios/KaBOOM!/BOOM! Town panel taking place on Saturday, October 13th, from 5:15pm-6:15pm in room 1A07! Join Editor-in-Chief Matt Gagnon, Managing Editor Bryce Carlson and VP of Publishing and Marketing Filip Sablik along with surprise guest creators as they run down the most exciting new projects and reveal upcoming titles from BOOM! Studios, KaBOOM!, and BOOM! Town! Get the inside scoop on upcoming series like BRAVEST WARRIORS, DEATHMATCH, SUPURBIA, and many, many more before anyone else! Founded by Ross Richie, 2009 and 2010’s “Best Publisher” BOOM! Studios (www.boom-studios.com) generates a constellation of bestselling Eisner and Harvey Award-winning comic books and graphic novels with the industry’s top talent, including Dan Abnett and Andy Lanning’s HYPERNATURALS, new HELLRAISER comics written by Clive Barker, PLANET OF THE APES, and Sam Humphries’ HIGHER EARTH. BOOM!’s all ages imprint KaBOOM! publishes Charles Schulz’ PEANUTS, Jim Davis’ GARFIELD, Cartoon Network’s ADVENTURE TIME, and 20th Century Fox’ ICE AGE. KaBOOM! recently won an Eisner Award for its first original series Roger Langridge’s SNARKED. BOOM!’s lit comix-focused imprint, BOOM! Town, won an Eisner Award for its first book, Shannon Wheeler’s I THOUGHT YOU WOULD BE FUNNIER, and just released SPACE DUCKS, the first comic book from indie musician legend Daniel Johnston. Cartoon Hangover (http://cartoonhangover.com/) –launched for young adults by Frederator Networks in 2012 as part of YouTube’s Original Programming initiative– is the home for cartoons that are too weird, wild, and crazy for television. Included in the premium channel’s ten original series are Pendleton Ward’s Bravest Warriors, directed by Breehn Burns, James Kochalka’s SuperF*ckers, and Too Cool! Cartoons, a series of 39 four-minute shorts by tomorrow’s animation hitmakers, including Natasha Allegri (“Bee and PuppyCat”), Mike Rosenthal (“Our New Electrical Morals”), and Mel Roach (“Rocket Dog”).Channel Frederator, with over 23 million YouTube views, launched the first all-cartoon video podcast in 2005 and was the first channel distributed by Next New Networks (acquired by YouTube in March 2011). Its first original series were the 2008 hit series The Meth Minute 39 and Nite Fite. Frederator Studios was founded by Hanna-Barbera president Fred Seibert in 1998 as a unique incubator for big animation ideas by producing original cartoons. More than 200 short films have resulted in 16 hit series for television and the Internet, including Butch Hartman’s The Fairly OddParents, Genndy Tartakovsky’s Dexter’s Laboratory, Craig McCracken’s The Powerpuff Girls, Eric Robles’s Fanboy & Chum Chum, and Pendleton Ward’s Adventure Time.Frederator is in partnership with Sony Pictures Animation to develop and produce feature animated films, and YouTube to create new cartoon content and channels. 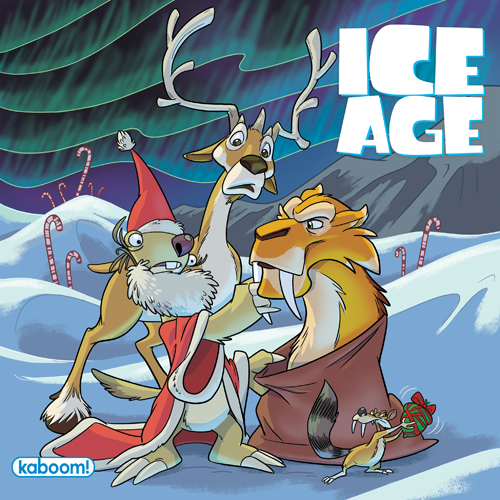 Tags: Boom Studios, Christmas, holiday, Ice Age, kaboom! This October, KaBOOM! is proud to announce the release of ICE AGE: PAST, PRESENTS AND FUTURE, the latest in a series standalone specials consisting of all new stories inspired by the hit movies. ICE AGE: PAST, PRESENTS AND FUTURE, is an ICE AGE holiday tale! Recollecting what a huge “help” he was last year, Sid decides to pay Santa and the North Pole a visit and once again offer his assistance for Christmas preparations! Before anyone can stop him, he’s opened a box filled with Santa’s magic…and he finds himself visiting Sids in the past, present and future! ICE AGE: PAST, PRESENTS AND FUTURE will be available in finer comic stores on October 17th, 2012. This 8” x 8” title, which is accessible to all ages, will run 24 pages in full color and will carry a $3.99 price point. Written by Caleb Monroe (STEED AND MRS. PEEL) and with art by Shelli Paroline and Braden Lamb (ADVENTURE TIME), this new issue is sure to bring laughter and joy to all ages just in time for the holidays. About BOOM! Studios Founded by Ross Richie, 2009 and 2010’s “Best Publisher” BOOM! Studios (www.boom-studios.com) generates a constellation of bestselling Eisner and Harvey Award-winning comic books and graphic novels with the industry’s top talent, including Mark Waid’s IRREDEEMABLE, Dan Abnett and Andy Lanning’s HYPERNATURALS, new HELLRAISER comics written by Clive Barker, PLANET OF THE APES, and Sam Humphreys’ HIGHER EARTH. BOOM!’s all ages imprint KaBOOM! publishes Charles Schulz’ PEANUTS, Jim Davis’ GARFIELD, Cartoon Network’s ADVENTURE TIME, and 20th Century Fox’ ICE AGE. BOOM!’s lit comix-focused imprint, BOOM! Town, recently won the Eisner Award for its first book, Shannon Wheeler’s I THOUGHT YOU WOULD BE FUNNIER, and just released SPACE DUCKS, the first comic book from indie musician legend Daniel Johnston.